The world of videogame crossovers can be pretty wild, but I’m not sure I was ready for skating to be combined with the modern-day shooter. I was quite surprised then, to find out that not only is such a game in active development, but it’s actually looking pretty impressive. While most of the environments aren’t in place, a lot of the physics seems to be in working order, resulting in some very impressive gifs. A particular highlight involves an impressive acid drop, before the skating hero flips over one enemy before blowing up another. You can check that particular moment out in the tweet embedded below. Of course, all the bullet-time skating tricks in the world don’t necessarily make a game into a good take on Doom. For that, you clearly need boss fights, and on that front Chonkurabb doesn’t disappoint. Their latest revelation introduces an enormous bug equipped with what appears to be both a Gatling Gun and a quad rocket launcher. 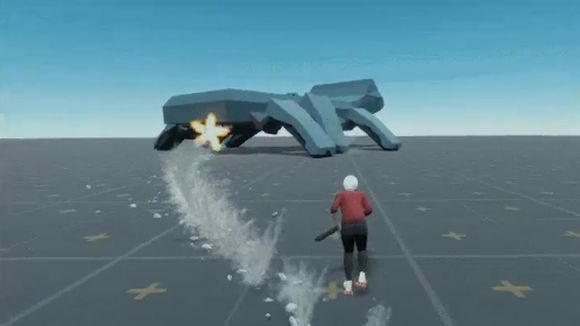 In suitably gnarly fashion, our hero skates up the monster’s leg, enters bullet time and blows up that rocket launcher. This being a game inspired by old-school Tony Hawk, there are of course ample opportunities to pull of tricks, which means that the boss’ head can be used as a quarter-pipe, so some very welcome flair is added via the medium of a 720-degree flip. Check it out below. The Tony Hawk/Doom crossover has no release date, and it’s still very early in its development. If you like the look of skating and bullet time, however, Chonkurabb is quick to point people in the direction of My Friend Pedro. Blending slow motion gunplay seamlessly with the wisdom of a talking banana, the game was initially shown off at Devolver Digital’s show at E3 2018.